From world-class cuisine to luxury retreats, Thailand is a country offering a bounty of arts and cultural experiences, fresh flavors, Michelin Star restaurants, and picturesque beaches. In this edition of Featured Journeys, we highlight a multi-destination itinerary beginning in the northern region of Chiang Rai where guests can explore the Golden Triangle, then on to the cosmopolitan destination of Bangkok, and finishing on the island of Phuket. The northernmost province in Thailand, Chiang Rai is a broad valley with tree-lined riverbanks. Separated by Laos to the east and Myanmar to the west by the Mekong River, Chiang Rai offers a lush setting for travelers to relax and unwind before or after trekking trips to the Golden Triangle and Chiang Saen. Overlooking the border of Myanmar and Laos, Anantara Golden Triangle Elephant Camp & Resort is a luxury resort perched on a ridge in northern Thailand. Offering a tranquil jungle setting, the property is home to an award-winning elephant camp for rescued elephants with scientific and conservation programs. There are 40 room and 15 suites, including 6 family suites, all of which feature indigenous artworks, teak furnishings, and modern comforts like rain showers, soaking tubs, and balconies with daybeds. Guests of the resort have access to an array of one-of-a-kind experiences including cooking and cultural activities, spa services, and elephant encounters. FIVE STAR ALLIANCE PERK: Guests booking the "5 Star Signature Package" rate or "Best Available Rate" will also include a $100 Resort Credit per room/per stay (not combinable, not valid on room rate, no cash value), complimentary WiFI, and full breakfast for each guest daily. In addition, this hotel offers exclusive 2019 FIVE STAR ALLIANCE SUITE & VILLA PRIVILEGES that can be combined with the FIVE STAR ALLIANCE PERK (if requirements are met). 2019 FIVE STAR ALLIANCE SUITE & VILLA PRIVILEGES: Guests booking a stay of 2 or more nights in a villa or suite receive a $100 Spa Credit per stay. This offer is valid for stays of at least two nights through December 31, 2019 in Deluxe Suites. From palaces to street markets such as Chatuchak Weekend Market, Sampeng Market, and Pahurat Textile Market, Bangkok is a city with a variety of tourist attractions. There are famous temples including the well-known Wat Phra Kaew, Wat Pho, Wat Arun, Wat Phu Khao Thong, Wat Ratchanadda, Wat Traimit, Wat Benchamabophit, Wat Bowon, and Wat Sutat, as well as popular museums in west Bangkok like Don Kai Dee Benjarong Village, Phra Pathom Chedi, Sanam Chandra Palace, Don Wai Floating Market, Sampran Riverside, and Thai Human Imagery Museum. While in Bangkok, visitors will also want to explore the city's prime nightlife scene. In the historic district of Bangkok, The Siam Hotel is set amidst 3 acres of lush gardens on the Chao Phraya River. Close to the city's top historical sites and cultural attractions, the property offers guests a private urban retreat with an extensive arts and antique collection, luxurious suites and villas, award-winning Opium Spa, Muay Thai fighter program, and Sak Yant tattoos, which are a sacred Thai tradition. Plus, the property offers the Chon Thai Restaurant serving traditional Thai cuisine within a cluster of three 100-year-old Thai teakwood houses, Deco Bar & Bistro with international comfort cuisine, and the poolside Bathers Bar overlooking the Chao Phraya river. FIVE STAR ALLIANCE PERK: Guests making reservations with Five Star Alliance will also receive a $100 food and beverage credit per room/per stay (not combinable, not valid on room rate, no cash value if not redeemed in full), a selected welcome drink for two on the first evening at the pier or Deco Bar, an afternoon treat from 3 – 4 PM at Deco Bar or swimming pool for guests staying in a pool villa. Located in Southern Thailand, Phuket is a beach destination on an island in the Andaman Sea. Easily reachable via a one-hour flight from Bangkok, Phuket offers some of the world's top beaches including Rawai, Patong, Karon, Kamala, Kata Yai, Kata Noi, and Mai Khao. For one-of-a-kind sunsets, visitors should head to Laem Phromthep Viewpoint, considered to offer some of the most picturesque sunsets in Thailand. Strongly influenced by the Chinese, travelers to the island will see Chinese shrines and Chinese restaurants around the city, and there is a Chinese Vegetarian Festival held yearly, as well as an array of international influences and trendy nightlife scene. Set on a hillside, Amanpuri is a luxurious place of peace. Interiors feature original artworks, hand-loomed silks, fragrant orchids, and custom-crafted furniture. Elegant dining options highlight Thailand cuisine, as well as fresh Japanese sashimi at Nama restaurant, Italian cuisine at Arva, along with Mexican snacks and cocktails at the Latin American Bar. There's a black-tiled pool, as well as the beach and water sports in the Andaman Sea such as snorkeling, kayaking, and jet-skiing. FIVE STAR ALLIANCE PERK: Guests booking the "5 Star Signature Package" rate will also include continental breakfast for two daily in the Dining Room or through room service and a $100 USD hotel credit per room/per stay. 2019 FIVE STAR ALLIANCE SUITE & VILLA PRIVILEGES: One lunch for up to two people per room, excluding alcoholic beverages and gratuities, once during their stay (value $100). Note: Nama, Amanpuri Japanese restaurant is not included. This offer is valid for stays of at least two nights through December 31, 2019 in Ocean Pool Pavilion, Premium Ocean Pavilion, 2 Bedroom Pool Pavilion, 2 Bedroom Garden Villa, 2 Bedroom Ocean Villa, 3 Bedroom Garden Villa, 3 Bedroom Ocean Villa, 4 Bedroom Garden Villa, 4 Bedroom Ocean Villa, 5 Bedroom Garden Villa, 5 Bedroom Ocean Villa, 6 Bedroom Garden Villa, 6 Bedroom Ocean Villa, 7 Bedroom Garden Villa, 8 Bedroom Garden Villa, 8 Bedroom Ocean Villa, or 9 Bedroom Ocean Villa. Showcasing one-of-a-kind Santorini sunset views, the Deluxe Junior Suite at Santo Maris Oia Luxury Suites & Spa is an idyllic retreat for honeymooners or couples seeking a luxe space for a romantic retreat. Featuring modern Greek styling, the suite is furnished in shades of white with lush textures and finishes. There's a separate lounge area, kitchenette, and a private veranda ideal for enjoying privacy while taking in the views of the sea and sunsets. Read more about the property below the photo. Amidst greenery, whitewashed domed suites, and picturesque alleys, Santo Maris Oia Luxury Suites & Spa provides guests with exclusive Aegean Sea views and world renowned Santorini sunsets. All of the accommodations have private verandas with Jacuzzis and sun loungers, as well as kitchenettes. The property's Royal Spa is one of the largest spas in Santorini with an indoor swimming pool, steam bath, cryotherapy, sauna, and outdoor gazebo experience. While the hotel's Alios Ilios Restaurant provides guests with a five-star modern Greek gastronomic experience. Ready for a beach retreat? Andaz Mayakoba is currently offering a "One More Night"* Promotion. Guests booking three consecutive nights will receive a fourth night free for stays booked by March 31, 2019. Valid for travel from January 3 to April 13, 2019, the resort is surrounded by white sand beaches and the turquoise waters of the Caribbean Sea. 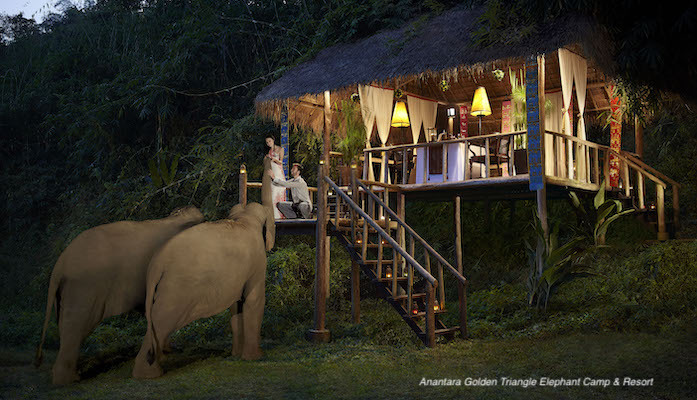 Read more about the property and a special Five Star Alliance Perk below the photo. Amidst the area's tropical mangroves, the resort has two pools, four restaurants, and a full-service spa. The family-friendly property also offers a kids' club, bicycles, and nature trails for exploring, as well as outdoor activities. In addition, this resort has an exclusive Five Star Alliance Perk. Learn more about the property below the photo. FIVE STAR ALLIANCE PERK: Guests making reservations with Five Star Alliance will receive buffet breakfast daily in Cocina Milagro (maximum of 2 guests), and $100 USD Resort credit, per room/per stay applicable to Spa treatments or food & beverage in any of the four restaurants (not combinable, not valid on room rate, no cash value if not redeemed in full). *The "One More Night" promotion is valid for bookings at Andaz Mayakoba through March 31, 2019, for travel completed by April 13, 2019. This offer is subject to availability and may change at any time, restrictions apply. Featuring a private pool overlooking the Caribbean Sea, the Beachfront Villa Suite with Two Bedrooms at Zemi Beach House is an idyllic retreat for families or groups. Situated directly on the beach, the 1,931-square-foot suite has one bedroom with a king bed, and a separate bedroom with two twin beds. There's also a fully-equipped kitchen where guests can enjoy the comforts of home within the suite, as well as a spacious living room. While the private terrace has a pool providing the ultimate spot to lounge with panoramic sea views. Continue reading below the photo of the Beachfront Villa Suite's private pool. The Zemi Beach House has a collection of eight oceanfront two- and three-bedroom suites offering contemporary Caribbean styling, private terraces with pools, and plenty of space for families or friends traveling together. Located on the shores of Shoal Bay East, the resort is set on six acres of land adjacent to Anguilla's Fountain Cavern National Park. Accommodations feature luxurious tropical island styling, personalized Caribbean minibars, premium bath amenities, and 24-hour room service. Within the resort there are two restaurants, three bars, the Zemi Thai House Spa, kids' club, tennis court, and water sports, plus a beach concierge. Learn about an exclusive Five Star Alliance Perk below the photo. FIVE STAR ALLIANCE PERK: Guests making reservations with Five Star Alliance will receive a complimentary buffet breakfast for up to two guests daily in 20 Knots, a $100 food and beverage or spa credit, per room, per stay. Also, subject to availability at the time of check-in, a room upgrade, early check-in, and late check-out. Overlooking lush gardens or a lagoon, the Luxury Pool Junior Suites at Eden Roc at Cap Cana provide an ideal setting for romantic getaways, or those seeking more privacy. Featuring airy vaulted ceilings, the 14 Luxury Pool Junior Suites have king size beds, goose down feather duvets and pillows by Hanse, and luxe bed linens by Carmignani. While living areas have sofa beds, 55-inch LCD TVs with advanced technology entertainment systems and Bose surround speakers, plus work desks with power outlets and ports. Read more about the Luxury Pool Junior suites below the photo. Luxurious bathrooms have coral stone bathtubs with marble Jacuzzis, contemporary rain showers, marble vanities, and separate lavatories with telephones. There's also Acqua di Parma bath amenities, luxe bathrobes and slippers, plus an exterior rain shower and spa area. In addition, each of the Luxury Pool Junior Suites has a private swimming pool and covered gazebo. Learn more below the photo. 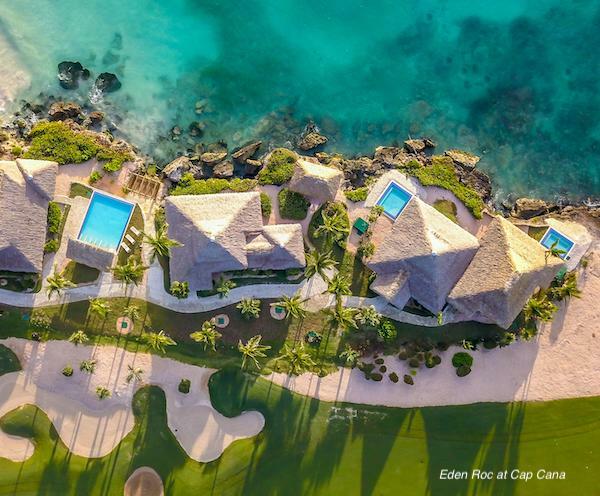 Eden Roc at Cap Cana is the only Relais & Châteaux hotel on the island. Envisioned by Milan designer Marina Nova, the property is fashioned more like a village than a resort with 34 freestanding suites, and the aesthetics inspired by the French and Italian Rivieras. There's event space for weddings and social gatherings, the Koko Kid's Club with organized activities, and the Solaya Spa for rejuevating treatments. Discover a Five Star Alliance Perks offer below the resort photo. FIVE STAR ALLIANCE PERK: Guests making reservations with Five Star Alliance receive a complimentary $100 food and beverage credit, a bottle of Champagne, a fresh fruit platter welcome amenity, and full breakfast daily, included in the rate. Also, subject to availability at the time of check-in: room upgrade, early check-in, and late check-out. Providing a mix of recreation and relaxation, Florida is an ideal destination for families, couples, adventure-seekers, theme park-lovers, and beach goers. In this edition of Featured Journeys, we explore a multi-destination itinerary through the Sunshine State. Beginning in Orlando, home of the "Happiest Place on Earth". Next up, Palm Beach known for luxury boutiques, beaches, and glittering estates. Finally, our journey ends in Miami, in the South Beach area recognized for Art Deco architecture, nightlife, and some of the world's best beaches. Situated in central Florida, Orlando is known for its theme parks including Disney, Sea World, and Universal Studios. A haven for families, this region also offers resorts with full-service spas and championship golf courses. Popular at all times of the year, visitors may want to plan their visit based on special events at the theme parks like Halloween or Christmas festivities. Surrounded by Disney, the Waldorf Astoria Orlando is an ideal gateway destination for Orlando's theme parks. Close to it all, the property offers a relaxing retreat with two resort pools and private cabanas, top-rated 18-hole Waldorf Astoria Golf Club, spa, and the WA Kids Club with organized activities for young travelers. Plus, an array of dining options inspired by the Waldorf Astoria New York with signature restaurants like Bull & Bear and La Luce. FIVE STAR ALLIANCE PERK: Guests booking the "5 Star Signature Package" rate will also receive continental breakfast for two daily, a $100 resort credit which may be applied towards spa or golf or recreation per room/once per stay, and a guaranteed late check-out at 4 pm. Located on the southeastern coast of Florida, Palm Beach is about 65 miles north of Miami. Along the Atlantic Ocean, this area has been a popular traditional winter home for American aristocrats for generations. There's upscale resorts, the world-class Norton Museum of Art, bird watching, and a variety of dining and nightlife options. Since opening in 1896, The Breakers has been an iconic destination for generations. Providing seaside glamour with Italian styling, the property continuously modernizes and revolves to meet the needs of contemporary guests with an indoor-outdoor fitness facility, newly unveiled spa, four pools, private beach, and nine restaurants. As the only oceanfront resort in the heart of Palm Beach Island, the hotel provides guests with an array of recreational and relaxation opportunities. FIVE STAR ALLIANCE PERK: Guests booking the "5 Star Signature Package" rate will also received full American breakfast buffet for two daily at The Circle or The Beach Club Restaurant and a $100 resort credit per room/per stay (not applicable to room rate, taxes and gift cards). Infused with Cuban culture, Miami is a diverse destination with a vibrant downtown, one-of-a-kind nightlife, array of shopping, and top-notch museums. The diversity of the city provides visitors and locals alike with a never-ending variety of dining options ranging from the trendiest foodie destinations in South Beach to down-home Cuban bodegas. For an urban setting, stay in downtown Miami, or if you're looking for a beach experience, choose a property along South Beach, which is filled with Art Deco buildings, stunning beaches, and an ideal people-watching scene. Offering direct beach access, the Royal Palm South Beach is a luxury hotel featuring Art Deco architecture with contemporary interiors. Just off Collins Avenue, the hotel is a short stroll from the boutiques and restaurants along Lincoln Road. Within the hotel, guests can relax at two pools, enjoy beach service, get a treatment at the full-service spa, or dine at Byblos serving Eastern Mediterranean cuisine. 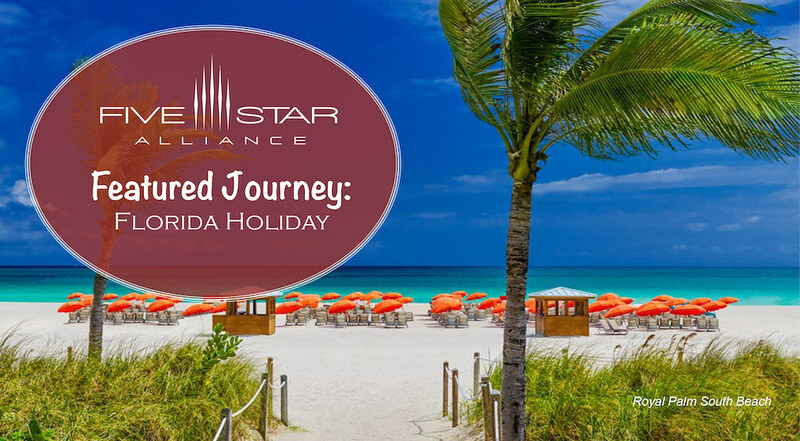 FIVE STAR ALLIANCE PERK: Guests booking the "5 Star Signature Package" rate or "Best Available Rate" will also receive continental breakfast for two daily in Florida Cookery and a $100 food and beverage credit per room/per stay. What's better than a waterfront villa? The King Pool Overwater Villas at Conrad Bora Bora Nui. Featuring one-of-a-kind horizon and lagoon views, plus private infinity pools, these overwater villas have 1,302 square feet of space. Providing luxurious accommodations, villas have fully retractable windows to bring the outside in, plush king beds with views of the lagoon, separate living areas with HDTVs, Bluetooth sound systems, and minibars, plus spacious bathrooms with soaking tubs. In addition, the villas have large terraces with private infinity pools, over-water hammocks, sun lounges, and direct access to the lagoon where guests can swim or snorkel from their own terrace. Read more below the photo. Situated on the private island of Motu To'opua, Conrad Bora Bora Nui is set amidst white sand beaches and the lagoon, with Mount Otemanu as the backdrop. Recently fully renovated, the property offers the hilltop Hina Spa with breathtaking views, six restaurants and bars, an infinity pool, and a variety of activities from hiking to swimming with sharks. Learn about the special Five Star Alliance Perk below the photo. FIVE STAR ALLIANCE PERK: Guests booking the "5 Star Signature Package" rate receive a XPF7000 food and beverage or spa services credit per room/per stay and an in-room welcome amenity.